While the American political scene is apparently preoccupied with the upcoming Presidential election, an enormous human tragedy has unfolded in the ancient city of Aleppo in Syria. Some families living in Aleppo go back to well over one thousand years. It is now the site of destruction of a horrific magnitude where hundreds of thousands of its residents are trapped with limited access to food, water and medicine as the city is under going a siege by Russian and Syrian government forces under the direction of President Bashar al-Assad. The Syrian civil war has been raging since 2011 and in 2016 the United Nations determined that 13.5 million of the nation’s inhabitants were desperately in need of humanitarian assistance with about 6 million internally displaced and some 4.8 million refugees in other countries. Worldwide, it is believed that there are currently over 60 million refugees who have been displaced from their countries of origin on account of conditions that make life apparently untenable. 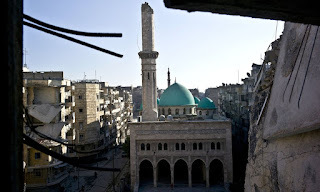 The social, economic, religious and political reasons for the violent upheaval taking place in Syria that has razed the city of Aleppo and ravaged its citizens are complex and multi-dimensional. This particular tragedy exposes the abysmal failure of the human kind to come to grips with its apparent inability to fashion a human world where the peaceful resolution of conflict is the preferred and necessary approach. Given the nature of the human condition and the inherent limitations of the human architecture, imperfection and conflict will always be present. The problem, however, lies within the way conflicts are resolved once they become a reality. Human civilization has been extant for at least ten thousand years; yet, the lesson has not been learned regarding the absolute and abysmal failure of violence and war as an effective response to conflict. With the looming threat of climate change beginning to overshadow any chance for an optimistic future for humanity, it has become imperative that we learn how to effectively cooperate with one another and learn quickly. Far too many humans are suffering needlessly. This suffering comes at an enormous cost to all of us. The ongoing tragedy of Aleppo is, in fact, a tragedy for everyone as members of an allegedly sentient race of beings that have the good fortune to experience life on this remarkable planet.